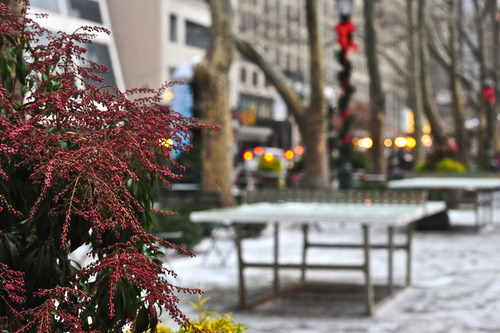 Meet Maureen Hackett, the woman behind the beautiful plants, flowers, and horticultural elements in and around Bryant Park. Fashion photographer, Bill Cunningham, spots funky winter hats at The Holiday Shops at Bryant Park and throughout NYC. 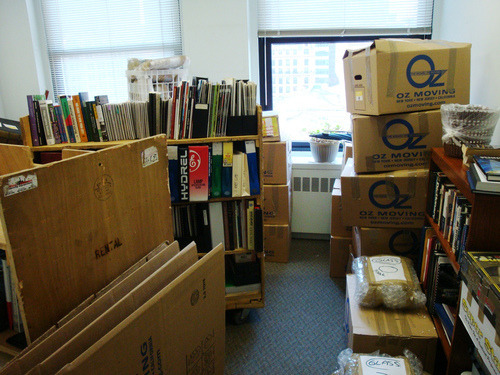 After 10 long and productive years in our headquarters on Fifth Avenue at 42nd Street, Bryant Park Corporation is packing up and relocating to a different corner of the park. Situated at the west side of the park, the new offices offer more room for our growing staff, and have wonderful views of the beautiful green space we work hard to maintain and improve every day. 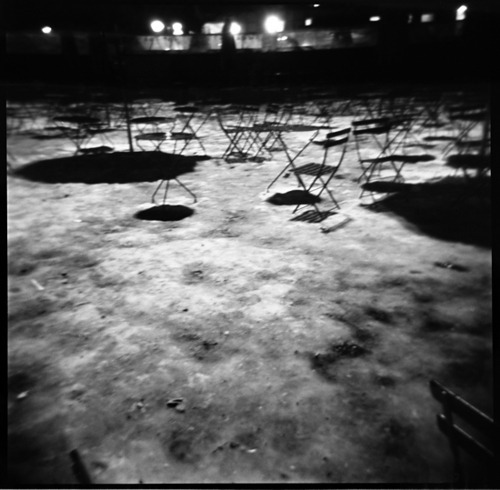 Please note that for short periods of time during our transition this weekend (from Friday, January 29 through the morning of Monday, February 1) the company phone lines and bryantpark.org website may be temporarily unavailable. 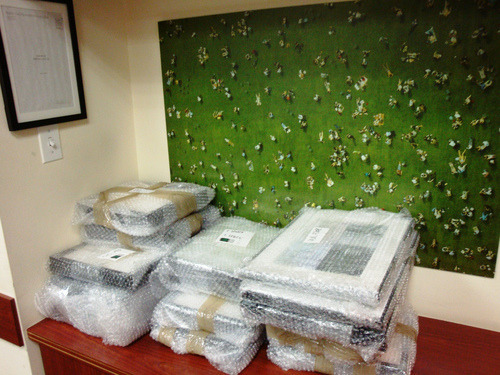 Please be patient, as all inquiries will be responded to as soon as possible on Monday. 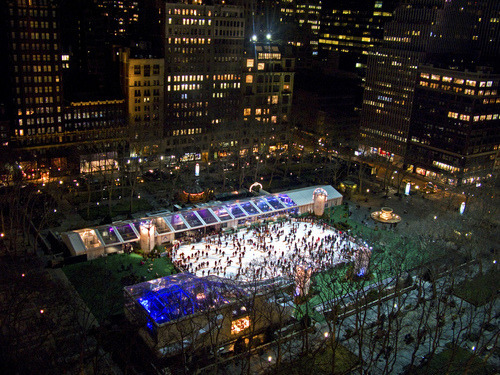 Skating season ended just yesterday at Bryant Park, but that doesn’t mean it’s too early to share our top five highlights of 2009 at The Pond. This year, The Pond landed a starring role in an Old Navy commercial alongside the famous Supermodelquins in their Alpine Hoodies. Filmed just one day before The Pond opened to the public, the commercial appeared on television sets all over the country throughout the holiday season. 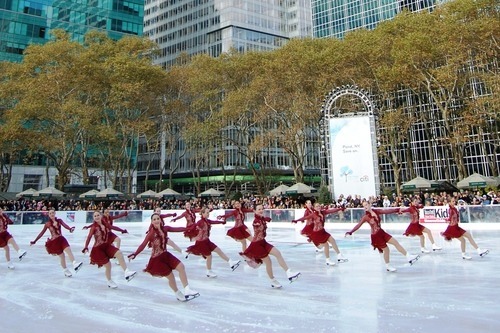 The fifth season of free ice skating at Bryant Park began on a beautiful day in November with live music performances and routines by Stars on Ice and synchronized skating champions, The Haydenettes. For the first time, The Holiday Shops opened to eager crowds on the same day as the rink. An annual tradition at the beginning of December, the park’s Tree Lighting Ceremony featured ice performances from Olympic skater, Elene Gedevanishvili, and synchronized team, The Lexettes. The public skated to live music and counted down as the tree was lit for the holiday season. For the team’s 16th annual Holiday Toy Drive, the New York Rangers returned to Bryant Park. Rangers, including Christopher Higgins, Michal Rozsival, and Ryan Callahan, signed autographs in exchange for toys donated to the US Marine Corps’ Toys for Tots program. Team alums Adam Graves, Brian Mullen, and Ron Duguay also visited The Pond to skate with fans. 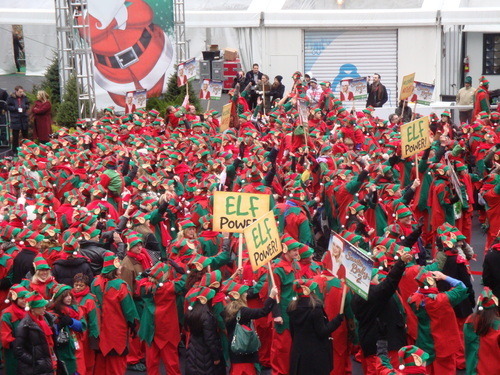 In early December, 607 men, women, and children donned costumes and congregated at The Pond to help ABC Family successfully break the Guinness World Record for the largest gathering of Santa’s Elves. It was quite a sight to see! What were your favorite moments this year at The Pond? 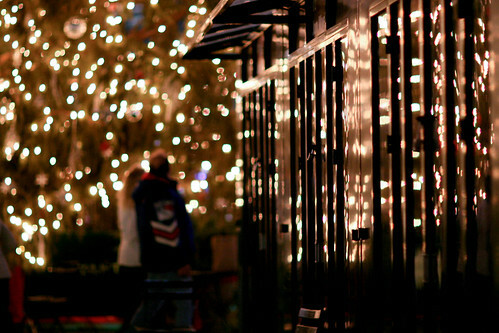 Bryant Park is, of course, one of the most romantic spots in New York City. The park's beauty, location, and fabulous amenities make it a natural destination for singles in search of that special someone, couples seeking the perfect rendezvous location, or soul mates looking to marry. We are constantly hearing from folks who met their future spouse, became engaged, or even tied the knot beneath the great plane trees. To honor the hundreds of couples in whose love story Bryant Park has played an important part, we are planning a special celebration within the coming months. But first, we need your assistance. If you know of anyone who has met their spouse, become engaged, or took their vows in Bryant Park, please contact us at ssigel@urbanmgt.com or (917) 438-5151. We are looking for stories and we are counting on you to help. 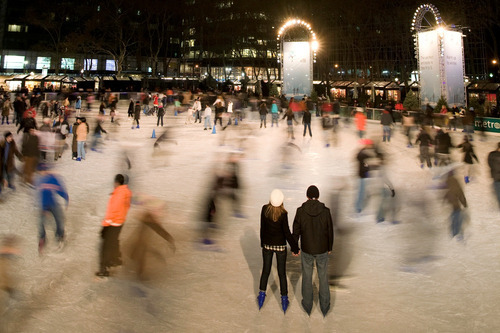 Labels: bryant park couples search, bryant park nyc, fall in love at bryant park? The polls are closed and new litter receptacles have been ordered for Bryant Park! We asked for your feedback on three potential litter receptacle designs and colors for the park and received a total of 2,711 votes in the polls, as well as many thoughtful comments on the blog and our Facebook page. Do you want to know what the winning receptacle looks like? Well friends, you’ll have to check back here (and in the park) this spring for the big reveal! We also took your comments into consideration for new litter receptacles we ordered for the parks managed by our sister company, 34th Street Partnership. New receptacles will debut in the spring at Herald Square Park, Greeley Square Park, and sections of Broadway Boulevard from 33rd to 36th Streets. 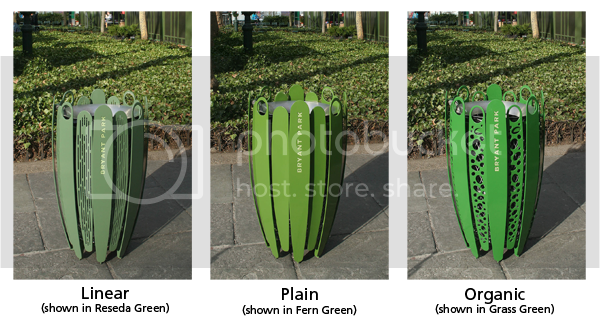 They will be different from the receptacles in Bryant Park, so if your favorite design/color combo didn’t win, you may be able to see it on 34th Street! In the design category, the Linear and Organic styles tied, as each received 36% of the 1,509 votes. The Plain receptacle design came in close at 28%. In the color category, Reseda Green led the pack with 38% of 1,202 votes. Fern Green received 32% of the votes, followed closely by Grass Green at 30%. Thank you to everyone who voted and left comments on the blog and Facebook, and thank you to Curbed for picking up the story in December! You’ve seen the structure in the park, but what can you expect inside? Celsius at Bryant Park is a two story restaurant and lounge that accompanies The Pond every winter season. Both levels provide excellent views of the ice skating rink. Indoor and outdoor heating, and a menu of comfort foods like macaroni and cheese, chicken pot pie, and chili, create a toasty venue for business lunches, leisurely meals, after work drinks, or parties. Four coworkers and I headed to Celsius for lunch last week. We opted for an indoor table and were seated on the second floor next to the westward facing wall of windows. As expected we engaged in some spectacular people watching during the meal. On to the food. 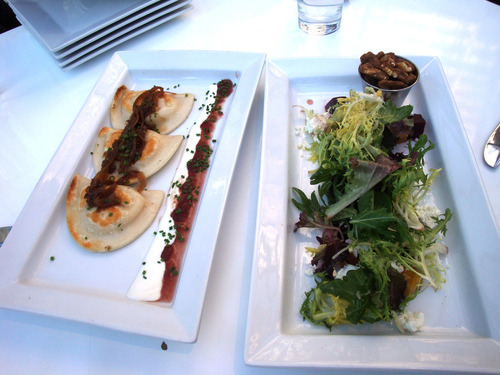 Two plates were ordered to share as appetizers: the Beet and Goat Cheese Salad (described on the menu as mixed greens, roasted beets, goat cheese, spiced walnuts and white balsamic vinaigrette) and Potato and Cheese Pierogies (with pomegranate-apple compote, sour cream and caramelized onions). 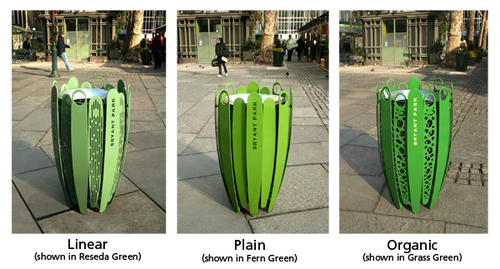 A few weeks ago, we requested feedback on three litter receptacle prototypes for the park, designed and developed by Bryant Park Corporation’s Director of Design, Ignacio Ciocchini. The response in the polls and comments section of the post has been incredible. To those who have voiced an opinion, thank you! If you haven’t yet, there is still time to vote for your favorite receptacle design and color. The polls will close at midnight on Friday, January 15. Visit the park this week to view the prototypes in person, then share your opinion of the most suitable receptacle for Bryant Park here on the blog. Location Update: Because we will create close to 100 litter receptacles of the chosen design and color, it is important for us to see how the prototypes look in various locations throughout the park. The litter receptacle prototypes are now located near the entrance to the park at the corner of 42nd Street and 6th Avenue, across from the Ping Pong Area. Originally placed on the Fountain Terrace against a bluestone backdrop, this new location allows the receptacles to be seen against one of the park’s many green ivy beds (see photo sets below). If seeing the receptacles against a different backdrop affects your thoughts on the color and design choice for the final receptacle, you can vote again or leave a comment explaining your change in opinion. 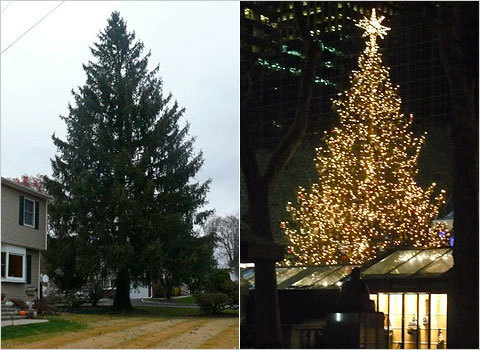 Touching story of a woman who grew up with the Bryant Park Tree and her visit to see it in the park. American Dairy Association event at The Pond achieves World Record status. 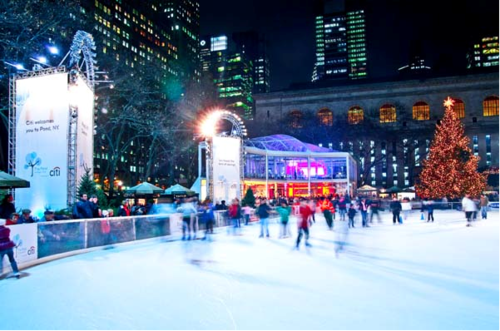 Summary of last year’s notable projects and events in Bryant Park and the 34th Street area. Click here to subscribe to MidCity News by email. A new Business Improvement District grows in Brooklyn. The cast of Broadway’s The Fantasticks will appear at The Pond to sing a few numbers, meet fans, and raffle off tickets to their hit show. The life story of this season’s Holiday Tree in the park. Expert birder observes and photographs a species rarely seen during Northeastern winters in the park. Enhanced lighting is brighter and more environmentally friendly this year at The Pond at Bryant Park. 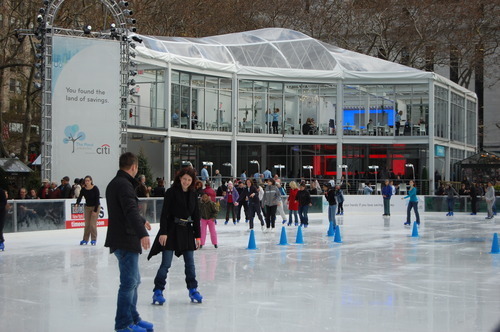 The Pond is compared to City Ice Pavilion in Long Island City, Queens. “Ready, set, change San Jacinto” from El Paso Inc. Developers list Bryant Park as inspiration for public park in downtown El Paso, Texas.